Do you organize tours to northern & southern Italy? Are you a guide? If the thematic is based on culture,history and outdoor activities,we would love to talk to you. Offri dei tours per il nord e sud Italia la cui tematica si basa sulla cultura, storia e attivita' all'aperto? In questo caso ci piacerebbe parlarti. Central Italy - Italia centrale or just Centro, is one of the five official statistical regions of Italy used by the National Institute of Statistics (ISTAT). Tuscany is known for its landscapes, traditions, history, artistic legacy and its influence on high culture. Seven Tuscan localities have been designated World Heritage Sites: the historic centre of Florence (1982); the historical centre of Siena (1995); the square of the Cathedral of Pisa (1987); the historical centre of San Gimignano (1990); the historical centre of Pienza (1996); the Val d'Orcia (2004), and Medici Villas and Gardens (2013). Painters such as Cimabue and Giotto, the fathers of Italian painting, lived in Florence and Tuscany as well as Arnolfo and Andrea Pisano, renewers of architecture and sculpture; Brunelleschi, Donatello and Masaccio, forefathers of the Renaissance, Ghiberti and the Della Robbias, Filippo Lippi and Angelico; Botticelli, Paolo Uccello and the universal genius of Leonardo da Vinci and Michelangelo. Tuscany produces wines, including Chianti, Vino Nobile di Montepulciano, Morellino di Scansano and Brunello di Montalcino. Most of the region is mountainous or hilly, the main features being the Apennine chain along the internal boundary and an extensive system of hills descending towards the Adriatic. The coastal area is 173 km long and is relatively flat and straight except for the hilly area between Gabicce and Pesaro in the north, and the eastern slopes of Monte Conero near Ancona. Since the 1980s the economy of the region has been radically transformed, without however repudiating its rural past. Many of the small craft workshops scattered throughout the rural settlements have modernized and become small businesses, some of which have become major brands known all over the world (Indesit, Tod's, Guzzini, Teuco). The region continues to draw tourists, whose increasing numbers have been attracted by the rich and broadly distributed heritage of history and monuments, as well as by the traditional seaside resorts.Marche forms, along with Emilia-Romagna, Tuscany and Umbria, the Italian "Red Quadrilateral", a strongly left-wing area. The region is named for the Umbri tribe, one of those who were absorbed by the expansion of the Romans. The language was Umbrian, one of the Italic languages, related to Latin and Oscan. The Etruscans were the chief enemies of the Umbri, eventually they were successful in driving the Umbrians towards the Apennine uplands and capturing 300 Umbrian towns. 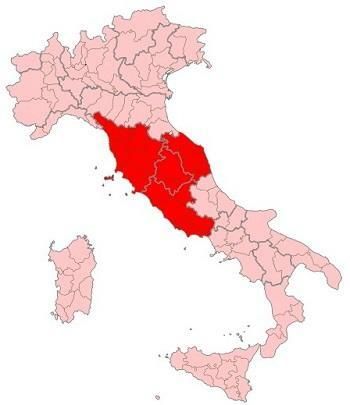 Nevertheless, the Umbrian population does not seem to have been eradicated in the conquered districts. The region is characterized by sweet and green hills and historical towns such as Assisi (a World Heritage Site associated with St. Francis of Assisi, the Basilica of San Francesco and other Franciscan sites, with works by Giotto and Cimabue), Norcia (the hometown of St. Benedict), Gubbio, Spoleto, Todi, Città di Castello, Orvieto, Cascata delle Marmore, Castiglione del Lago, Passignano sul Trasimeno and other charming towns and small cities. 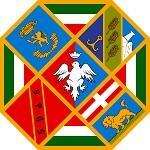 Other cities : Frosinone - Latina - Rieti - Viterbo. The Italian word Lazio descends from the Latin word Latium. The name of the region also survives in the tribal designation of the ancient population of Latins, Latini in the Latin language spoken by them and passed on to the city-state of Ancient Rome. In Roman mythology, the tribe of the Latini took their name from king Latinus. 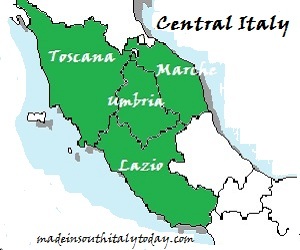 A major modern etymology is that Lazio comes from the Latin word "latus", meaning "wide", expressing the idea of "flat land" meaning the Roman Campagna. Much of Lazio is in fact flat or rolling. Lazio comprised the short-lived Roman Republic, in which it became a puppet state of the First French Republic under the forces of Napoleon Bonaparte. On 20 September 1870 the capture of Rome, during the reign of Pope Pius IX, and France's defeat at Sedan, completed Italian unification, and Lazio was incorporated into the Kingdom of Italy.